St. Brigid has been in existence since 1855 so there are thousands of alumni out there. There have been several reunions over the years of St. Brigid High School graduates and a few reunions of some of the elementary school classes. However, information on graduates’ current whereabouts is sketchy. In an attempt to create a more current database of our graduates, we are requesting that alumni send us their current information by printing the Alumni Info document on the right side of this page, filling it out, and mailing it to St. Brigid School, Attn: Alumni Database, 312 Fairground Rd., Xenia, Ohio 45385. You can also send the information requested in an e-mail to jabel@stbrigidxenia.org. We hope to hear from you! We have officially begun an Alumni Association for St. Brigid School. Current activities include building a database with current information on our alumni, planning a get-together for alumni (perhaps at Christmas time), creating a facebook page for St. Brigid School that will include alumni info, and assisting any individual classes with reunions. We are looking for an individual or two from each class to gather current information on the whereabouts of the members of their class. If you want to get involved, join us at our next meeting. Our facebook page is St. Brigid School Alumni – Xenia, OH. “Like” us and you will receive our updates automatically. Carroll High School held its Academic Awards Ceremony on May 11, 2016. St. Brigid graduates fared well with honorees including freshmen Calvin Cusack, Tyler Goecke, Ethan Perkins, Will severt, Olivia Wright, and Brian Zink. Those honored in the sophomore class were Reed Cusack, Thomas Lehmenkuler, and Emma Mihlbachler. Juniors honored were Julia Arnold, Alex Dingus, C. J. Howell, Chloe Lloyd, Amanda Perkins, and Danielle Spanbauer. Senior honorees included Beau Austin, Zandy Greene, Nick Keating, Dan LaJeunesse, Rhona Marion, Kurt Middleton, Stephen Peterson, and Emma Pollander. Junior, Amanda Perkins, received the Corey Cooper Memorial Scholarship. Congratulations! St. Brigid Class of 2009 alumni, Nick Donohue (4th from right), is a Commended Student in the National Merit Scholarship Competition for 2013. 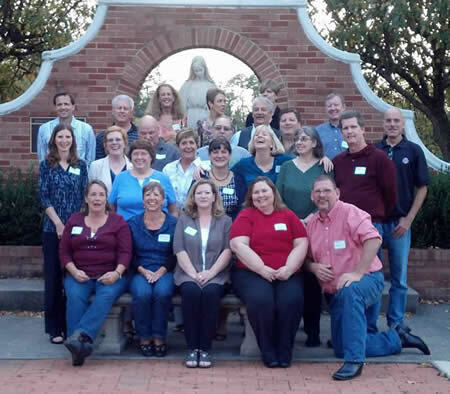 The St. Brigid Class of 1972 gathered on September 29, 2012 for their 40 year reunion.